Yangtze River Cruise Prices 2019/2020: What’s Included & Excluded? 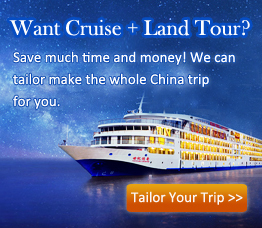 When planning your Yangtze River cruise in China, you should know clear about the cruise prices shall be paid. The quoted price on our website of a specific cruise ship covers the accommodation of the basic level, dining, arranged excursions, services, facilities, entertainment and other insurance, etc. Let’s see what detail items and services are included in and excluded from, the fee for traveling with children, and how to pay the Yangtze River cruise price. If you have any questions about the cruise fare, just feel free to ask our professional Travel Consultant who will give you good answers. The items at below are covered in your cruise fare, so you don’t have to pay extra to enjoy. ● Taxes charged by the government. What’s excluded from the Cruise Price? The following items are not included in your cruise cost. Therefore, if you want to enjoy the services, you could give the extra payment accordingly. The costs are reasonable. ● Meals Not Listed in the Itinerary: any meals not specified as “B”, “L”, and “D” (for breakfast, lunch and dinner). Usually the dinner for the embarkation day and the lunch for the disembarkation day are not arranged by the cruise company, which needs extra payment if you want to enjoy. ● Single Room Supplement: if you want to stay in one cabin (usually two beds in one cabin) on your own, you are required to pay more than sharing one room with another traveller. ● Upgrade Room or Deck: usually the rooms of basic level are arranged from the lower decks like the 2nd floor. If you want to upgrade your room up to better types or to upper decks, you can pay extra to enjoy. ● Tipping: the service charge of about 150 RMB for each one person is required to be paid when you checking in onboard the cruise. Besides, a gratuity to the cruise guide or the cruise director is excluded in the service charge, which may be given as travelers’ discretion based on your satisfaction with the services received. 1. All the items of including and excluding are shared by rooms of different types and on different decks. 2. Usually, travellers choosing executive cabins and suites will give higher price to cruise, which also enables them to enjoy better and more spacious room, more VIP services. You could ask our Travel Consultant for details. If you travel with your kids, you need to pay the extra fee. Usually a kid under 2 years old staying in the parents’ room is charged 10% - 20 % of the full price according to different cruise companies. For a kid of 2 – 11 years old, staying in the same bed with the parent is charged 50% - 67% of the full price, and staying in another bed in the parents’ room is charged 75% - 100% of the full price. And a kid of and more than 12 years old is required to give the full payment for staying in another bed or same bed with the parent in the same room, and is charged 75% of the full price if staying in an extra bed in the room. Since the charges are various for different cruise companies, you can have clearer information by asking our Travel Consultant and confirm it before booking and paying. If you have a 3rd adult passenger to enjoy the Yangtze River cruise with staying in an extra bed in your room (that can accept an extra bed), an extra payment of 75% - 100% of the full price is required to be given. As different cruise companies have different prices, you could inquire from our travel consultant for help. How to Pay the Yangtze Cruise Prices? Booking the Yangtze River cruise with China Discovery, you can enjoy very simple process of payment – you pay the deposit, we will then secure your cabins/suites; next, pay the balance to us and go to board your ship directly. There is no any fee to pay when board your ship. If you book a cruise in advance for more than 1 month, you are required to pay deposit which is 30% of the full cruise price, and pay the balance at least 1 month prior to the cruising date. However, if you book a cruise less than 1 month before the cruising date, the full cruise price is required to pay when booking. If you want to upgrade your cabins or decks, you can tell that to your travel consultant in advance and pay the fees. If you want to upgrade room types or decks, visit the optional shore excursions after boarding, you can directly tell that to the staff at the reception desk onboard the ship and give the extra fees. Note: For more detail price and info of each Yangtze River cruise ship, please feel free to contact our professional Travel Consultant!